What a brilliant idea to transform a graffiti-adorned grotspot by painting a mural of Aylesbury scenes. Now the Aylesbury Society is asking for people to nominate things to be included. Of course, it’s easy to be cruel and put forward some of the town’s less favourable ‘attractions’. The brutalist County Hall, Kingsbury’s ‘fountains’ (and the rather colourful characters who seem to gravitate there) and the town’s rush hour gridlock all spring to mind. But that would be churlish, because Aylesbury truly has much worth celebrating. My nominations would include beautiful St Mary’s Church, the Old Town, Market Square and its lovely clock tower. And how about a nod to the likes of Ludwig Guttmann, Stoke Mandeville Hospital’s father of the Paralympic Games, and much-missed actress Lynda Bellingham, who attended Aylesbury High School? However, Aylesbury has newer glories too. The Bourg Walk Bridge, for example, is a bold and attractive piece of modern architecture. And then there is the Waterside Theatre. It cost too much for sure, but head down Exchange Street at night, when its lights are all twinkling, and you would be hard pushed to find a prettier urban sight anywhere. 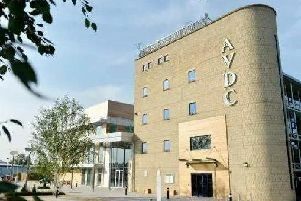 The Waterside Theatre surely demonstrates the potential of new development in Aylesbury which, whether we like it or not, is being transformed into a large town with a sizeable population. Indeed, perhaps the mural should be future-proofed and include up-coming development which I’m sure will add greatly to the fabric of town life. I’m talking here about the University Campus Aylesbury Vale (and indeed, the whole of the canal basin) and the new town square and restaurants by the Odeon Cinema. But I’m being cruel again.